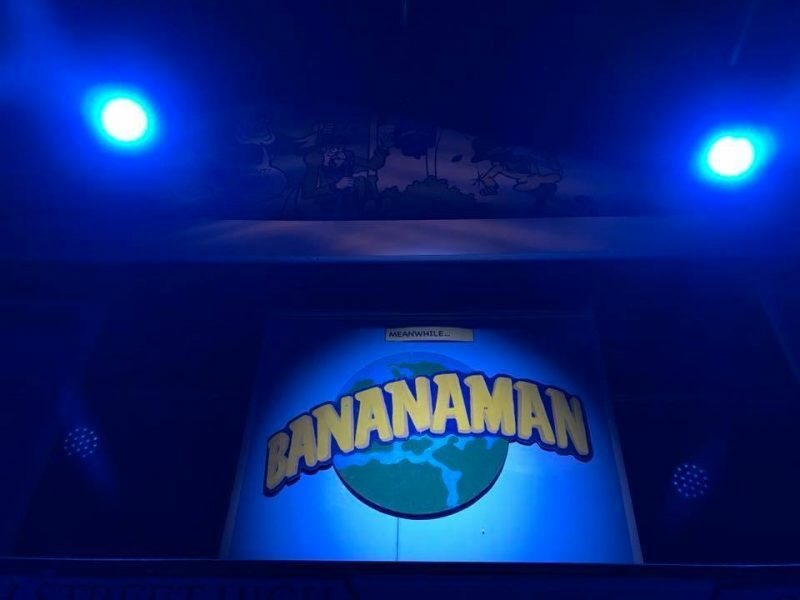 Last night, I headed over to the Southwark Playhouse in Elephant and Castle to see Bananaman in full-blown musical style with my babe, Kariss! For those of you that are currently making me feel my age, Bananaman is a super fun character from British comic books such as The Beano. Bananaman is a bit of a joke in comparison to your traditional superheroes, as he’s a young schoolboy, Eric Wimp, who is transformed into a muscled, caped figure when he eats a banana! And that’s exactly how he got his name! I have to admit I was a little bit sceptical about turning something so nostalgic into a musical as I’m not the hugest musical fan. I’d read some of the reviews and they were really mixed so, both Kariss and I decided to head on into the auditorium with open minds. 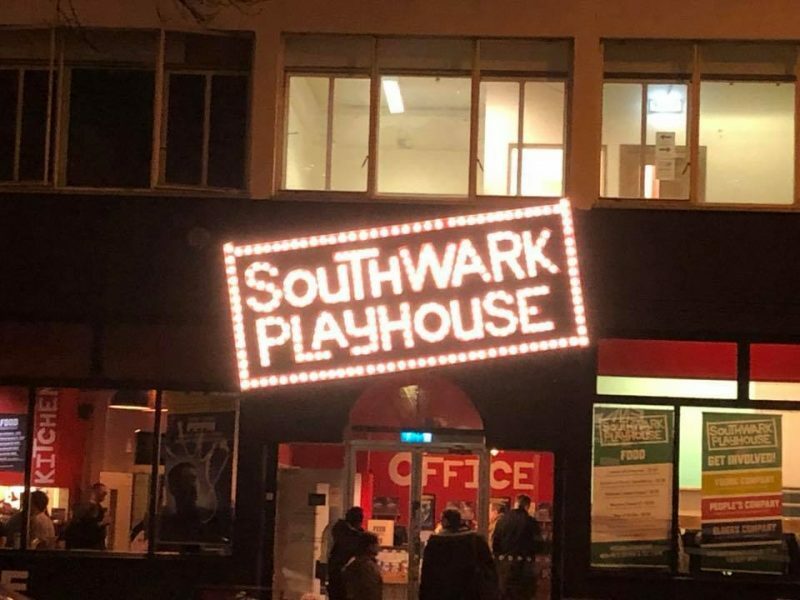 I do love the intimacy of Southwark Playhouse! I’d say there were no more than 50 seats, tiered, around the edge of a room all facing a comic book covered wall and an open floor space. Sat in the back right-hand corner we had a great view of all that was about to unfold in front us. The lights dimmed, the band above us swung into action and the production had begun. From about the second song in, I was fully invested in Eric getting the girl, keeping his mum happy and was on the edge of my seat waiting for him to become Bananaman! I was also secretly backing Doctor Gloom as his character was acted out so well that I wouldn’t want to watch anyone else when he was on stage. Not once did Marc Pickering drop his character and he was totally animated for the entire duration of the production. I also loved Jodie Jacobs as the Crow as her voice was incredible! Saying that though, all of the characters were very well rounded and a joy to watch. For a cast of 10 people, they played all extra roles extremely well and made you fill like there were tons more people on stage! They also used the very limited stage space very well. Although I was a little nervous when Doctor Gloom run up the stairs at us with his Really Big Gun, I thought for a moment I was going to get stunned! I have to say, I loved it. Really and truly loved it. We were sat giggling in our seats, proper tummy laughing at some points, so I’m so glad we went in with open minds. I think some people are just taking life too seriously as this was really good, nostalgic fun! I love it when something exceeds your expectations and has you enjoying every minute! I can’t put fault to the production at all, everything ran smoothly and the audience all seemed to enjoy it just as much as I did. There are only a few more shows left so be sure to get in quick, you really won’t regret it! "Breaking Rules with City Spice, Brick Lane *"
"A Trip Back in Time to Battlesbridge, Essex"